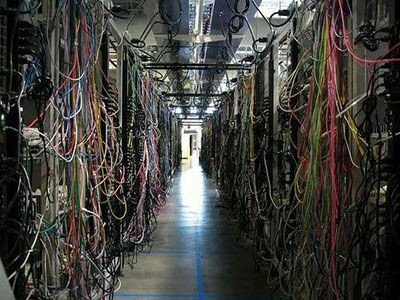 For many IT managers or datacenter professionals, one of the most difficult tasks is to keep cables in proper order. Imagine that you walk into a server room to troubleshoot cables because of the bad cable management, you see the cables here, cables there, and cables everywhere. Can you walk through this kind of datacenter without crying? Now that you have looked at the horrible side of cable management, it is time for you to do something to avoid joining the terrible cable management hall. From the above image, we can see that there are bunches of cables in one server room, which includes power cables, network cables, and in some cases, keyboard or mouse cables. In this situation, proper rack cable management is absolutely essential. Without it, you will need to trace out every cable in the rack anytime, this, of course, can be very time consuming and difficult. 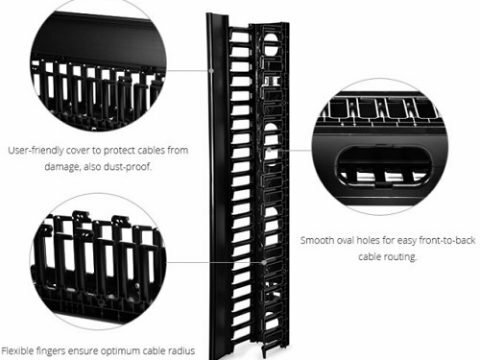 Fortunately, there are many excellent products available on the market, such as cable manager, wire duct, patch panel, cable ties and so on, which can help make cable management in rack environments much faster, easier and more effective. Whether you handle running cables for a massive corporate data center or for a small business, learning more about cable management can be very helpful. This article will have a brief introduction to vertical and horizontal cable managers. Good cable management is essential. When installing cables in a server rack, you will undoubtedly have to run them both vertically and horizontally. The best solution for this cabling is to run all the cables horizontally from the server directly to the vertical cable management rack. In this case, you would need the cable managers to hold the cables smugly and safely. This vertical and horizontal cable manager provides plenty of room for all the cables. Vertical cable manager just as seen in the below image utilizes the additional space to manage the slack from patch cords, and make sure that they can easily route the largest cable diameter in your plan. 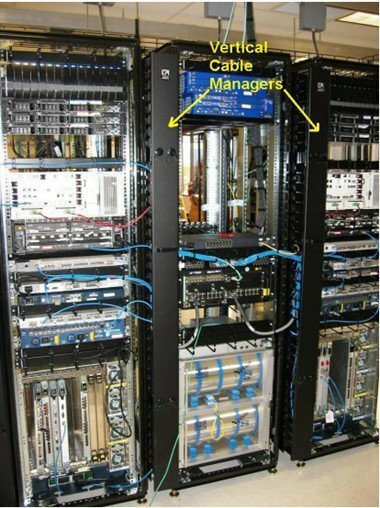 For static environments, you can consider installing another vertical cable manager behind the racks, which does not block access to components in the space between the racks. Vertical racks can be also installed under a desk or against a wall and accommodate networking equipment up to 4 RU. 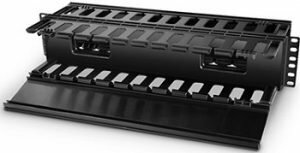 Horizontal cable managers allow neat and proper routing of the patch cables from equipment in racks and protect cables from damage. 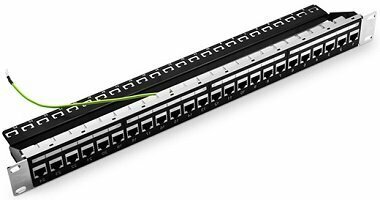 If you are using flat-faced patch panels or network switches that cable from above or below, horizontal cable manager will complete the support pathway for patch cords between the cabling section and the exact connection point (port) on the patch panel or switch. Alternately, horizontal management can be used to create rack-to-rack pathways for patch cords. The following image shows the 2u horizontal cable manager panel. 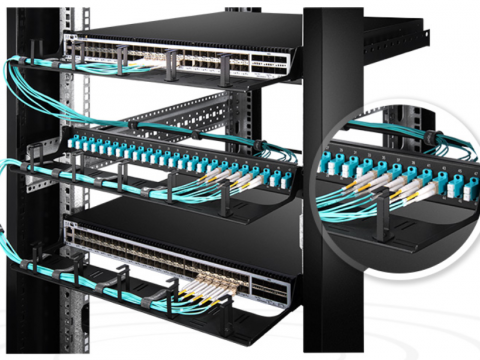 Select a style of horizontal cable management that complements the cabling section (vertical manager). 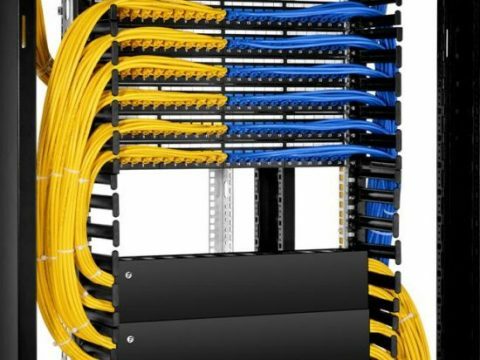 Generally, it is good practice to plan 1U of horizontal cable management for every 2U of connectivity. Cable fill should equal at the minimum, half of the ports supported by the cable manager. This method assumes that patch cords enter from both sides of the rack. Capacity should equal port density when cables enter from one side of the rack only. In some case, vertical cable manager and horizontal cable manager are often used together. The vertical cable manager guides cables to the floor and horizontal cable management draws away from the equipment. FS.COM cable management provides an engineered solution for managing high-density cabling applications, delivering increased performance to match the demands of data center applications. Use FS.COM Vertical and Horizontal Cable Managers on the sides of racks to manage premise cables, patch cords, and jumper cords. A wide variety of accessories include cable ties, cable management rings, cable lacing bars, J-hook, and wire loom. If you have picked the right rack cable manager (whether the vertical cable manager or the horizontal cable manager), the next important thing you should do is make sure you make a good preparation before deploying. Plan out every detail of the installation will help to ensure the cable management activities performed as quickly and easily as possible.